The VOTERS vehicle inspects the roadway for surface and subsurface defects as it drives. 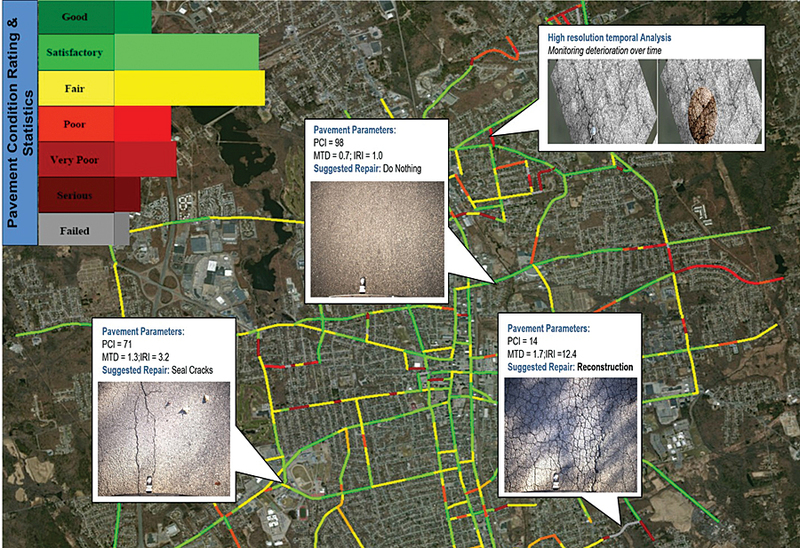 A new pavement condition monitoring system that incorporates GIS provides a simple, inexpensive way to detect surface and subsurface roadway defects. The Versatile Onboard Traffic Embedded Roaming Sensors (VOTERS) project enables continuous network-wide monitoring of roadways without setting up hazardous work zones and provides up-to-date pavement condition information to decision makers. Road defects must be identified. Traditionally, this has been done by conducting road inspections, which are disruptive to traffic flow. 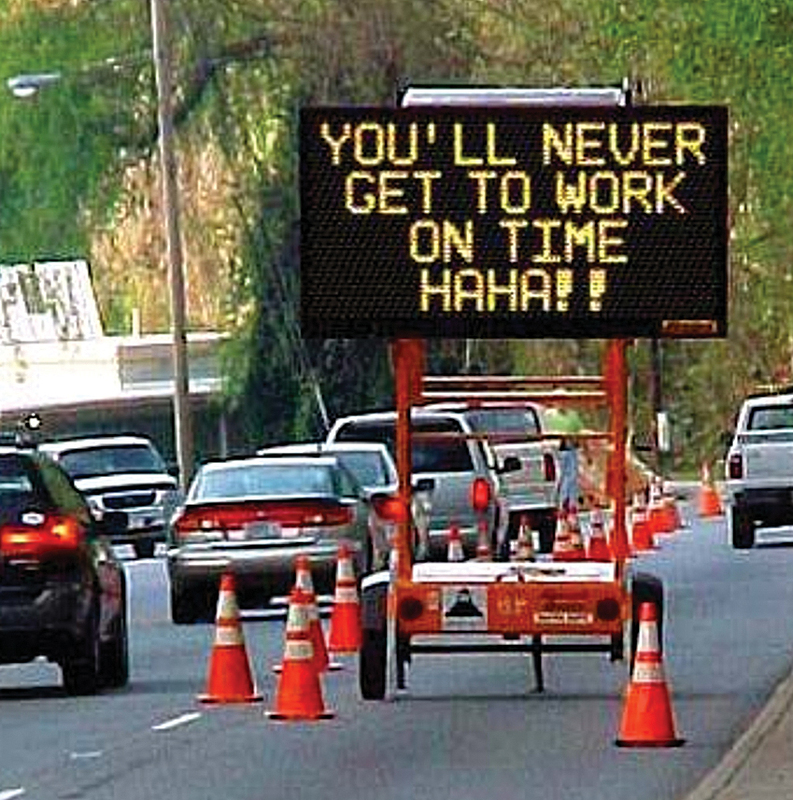 They involve road closures and cause congestion in work zones. In addition to wasting time, the stop-and-go traffic that inspections produce cause excessive air pollution. It is neither efficient nor feasible to carry out surveys frequently, so road survey information becomes quickly outdated, which renders maintenance schedules ineffective. When a city finally discovers there is a problem with a road, it’s already too late. There is a smarter way to do inspections. By outfitting vehicles with inexpensive, autonomous sensors that are capable of assessing road conditions, information on road defects such as cracks and potholes can be collected as those vehicles are driven. The VOTERS project has developed a framework and working prototype based on this concept. The VOTERS approach was born when Dr. Ming Wang, a professor of environmental and civil engineering at Northeastern University, heard a loud noise as he drove over a pothole. He realized that the sound tires make while interacting with the road can indicate how rough the road is. The National Institute for Standards and Technology (NIST) granted Wang and his team $18 million to further explore this idea. After five years of intensive studies and experimentation involving more than 40 graduate students, professional engineers, and faculty members, VOTERS has become more than an idea. PAVEMON supplies a color-coded overview of the roadway network's condition that can be queried by segment or user-defined area. The VOTERS system consists of multiple lightweight, inexpensive sensors that record three main modalities of acoustic, optical, and electromagnetic waves. When mounted on a vehicle, the system can scan more than 100 miles of road per day and identify existing and potential road distress. As this vehicle drives over the road surface, a small sensor inside the tire monitors changes in tire pressure that indicate the roughness or bumpiness of the road. A carefully calibrated microphone detects sounds produced by objects on the road. A unique radar system scans the surface between the wheels to ensure no road defect has been missed by the acoustic sensors. 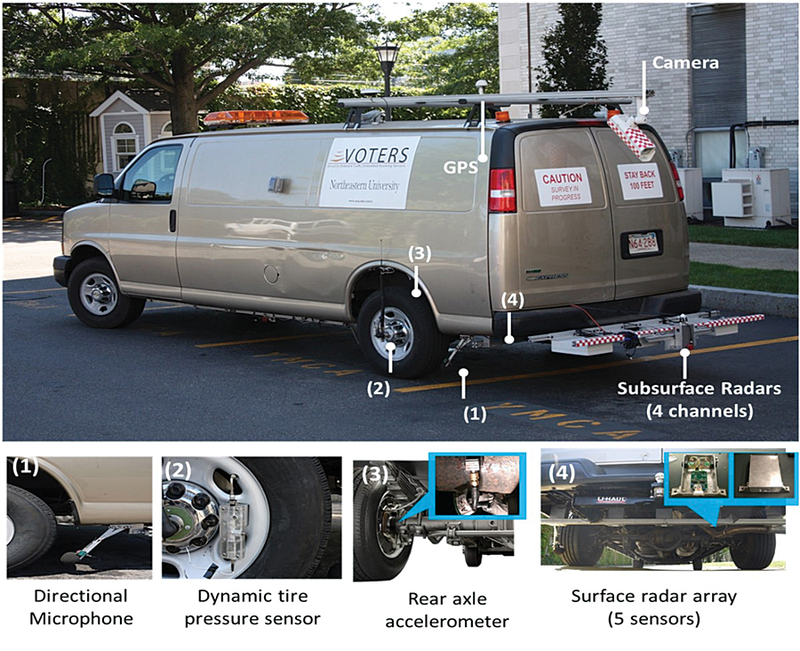 A video camera installed on the back of the VOTERS vehicle captures pavement pictures and automatically assesses damaged areas. With these sensors, VOTERS collects accurate and comprehensive data about the road surface. In addition, the VOTERS system locates areas with weak subsurfaces that will soon become potholes. This information could not be discerned by just inspecting the road surface. VOTERS gathers this information using various types of radar that can penetrate into the pavements and gauge the internal damage to sublayers. Positioning sensors is a crucial aspect of this mobile platform because it provides the location where each measurement was taken. The data collected feeds into a workstation that determines the condition and any repairs required for each road segment. Since VOTERS measurements are closely tied to geography, ArcGIS has been an ideal test-bed for processing and mapping VOTERS results. Esri has provided all the functionality necessary to deal with processing and georeferencing this complicated, diverse, and large dataset. PAVEMON makes the results of inspection and analysis available through a web browser. Through the use of Python scripts with ArcGIS for Desktop, data can be automatically analyzed and georeferenced, a crucial requirement for VOTERS given the rate that the system collects data. Compatibility with different types of databases (Oracle in this case) means that large amounts of data can be processed simultaneously and efficiently—a very valuable capability when multiple data sources are involved. A variety of users can benefit from the information VOTERS collects—from researchers and engineers to decision makers and infrastructure managers. With the current availability of Internet nearly everywhere, a web-based interface was used to enable global access. This was accomplished using ArcGIS for Server and the ArcGIS API for Flex. Using Esri technology, the VOTERS project team developed a pavement monitoring system called PAVEMON to accommodate and leverage VOTERS outputs for front-end users. Each VOTERS survey generates more than 80,000 images and 200 GB of data. The processed information from each survey appears on PAVEMON in days rather than months at a fraction of the cost of methods traditionally used to document road inspection. Users can perform different types of analyses through a web browser without installing any software. PAVEMON has custom toolboxes and interfaces that have been created using a combination of ActionScript and Python scripts. 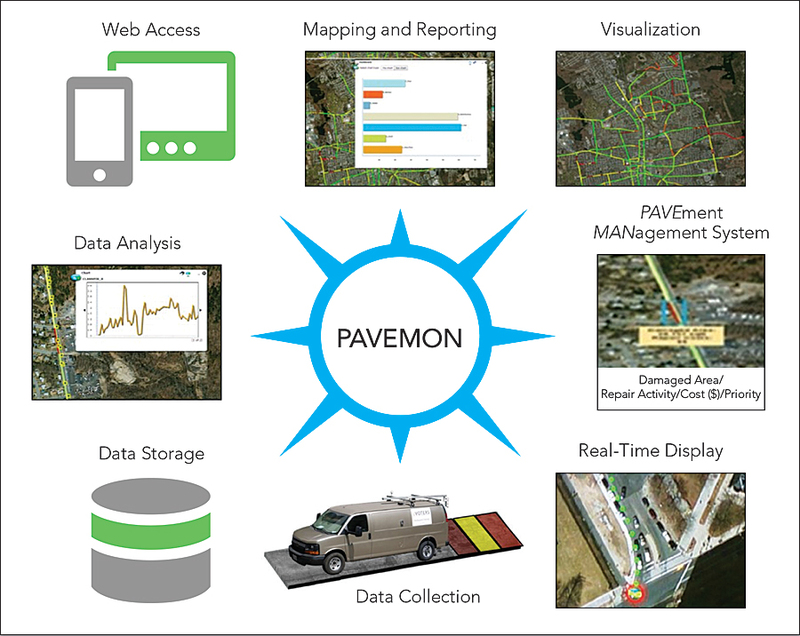 For example, the PAVEMON Pavement Management Module allows decision makers to do budget planning and maintenance scheduling from the numerous datasets managed by this application. Esri Tracking Server has even made PAVEMON capable of displaying the VOTERS vehicle in real time as it is collecting data. The conventional approach to road inspections is inefficient and disrupts traffic. It generates a color-coded map showing road conditions. Users can look at an image of specific roadway locations while querying for different road characteristics. Suggested repairs are generated by the system for a road segment or a user-defined area of the network. VOTERS technology is an autonomous sensor package that not only maps surface defects but can also locate potential pavement failures before they occur. Using ArcGIS, five years of studying the use of VOTERS have been showcased using PAVEMON. The positive reception it has received is a reflection of the VOTERS team’s hard work and Esri’s well-developed platform. The possibility that PAVEMON—a web map that allows municipalities as well as the public to see current roadway conditions—could become a global road condition app is intriguing. Cities would no longer need to close roads for inspections, because they would have more detailed information readily available. For more information about the VOTERS project or the PAVEMON application, contact Salar Shahini Shamsabadi.